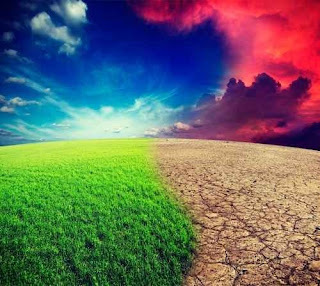 The recent Paris international climate agreement has drawn cheers and jeers. On the jeering side are of course climate deniers of all sorts, asserting climate change either isn’t happening or isn’t caused by us so we shouldn’t be making any climate agreements or taking any related actions. But as I pointed out earlier, this line of reasoning is nothing but stubborn ignorance, so let’s set that aside. Other jeers come either from those who either feel the agreement is too weak, lacking binding mechanisms to enforce reductions or having targets that won’t reduce emissions enough even if met, or from those who feel the targets are too ambitious and it will hamstring our economies if we try to reach them. Luckily, both can be refuted by the same line of evidence. Basically, vast reductions in greenhouse gas (GHG) emissions are possible, as soon as we make a real effort to achieve them. And while national or global targets may seem unreachable, if each actor takes care of their own piece of the puzzle, it all comes together. There is a role for every individual, family, business, institution, town or city. When each of us pledges to meet a target and make a sincere effort, our combined efforts will add up to a solution. One example: Laurentian University, which has programs at Barrie’s Georgian College. 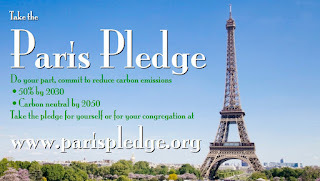 On December 16th of last year, the Paris Pledge for Action was released, and on December 22nd, Laurentian became the first university in Ontario, one of the first in Canada, and one of the first 1000 organizations worldwide to sign this commitment to work to reduce emissions immediately and meet or surpass the goals of the Paris Agreement. If every other educational institute or board does the same, an entire sector will be working on these goals, and other sectors can and will follow. Laurentian was quick to sign because they are already working to reduce GHG in many ways. Just a couple of years ago they hired their first Manager of Energy and Sustainability and since then she has been sparking initiatives across campus to save energy, reduce waste, and boost sustainability. Because provincial regulation mandates all post-secondary institutions track energy use, Laurentian has existing baseline measures as they create and work toward reduction targets building-by-building and campus-wide, and can benchmark against other Ontario institutions which must meet the same reporting standards. Hence universities compete to earn kudos (and save money) cutting energy use and related emissions. It also puts them in good stead as the province brings in a new carbon pricing cap-and-trade regime. While initiatives are voluntary, making them popular and widely accessible achieves significant reductions. Examples include regular forums with rotating themes allowing all stakeholders to come together to explore challenges and ideas and share best practices. Laurentian partners with groups like the Rainbow Routes trails association, reThink Green / Eat Local, and the Commuter Challenge; some professors make any student caught with disposable bottled water bring cookies for the whole class. Campus residences collect and redistribute furniture or other useful items left behind by graduating students, instead of throwing it all out. Ideas and programs are broadcast via campus email and newspapers, forums, bulletins, news releases, student groups, and Twitter. And beyond their local achievements, the university also contributes globally with research & technology, providing tools for others to reduce GHG. 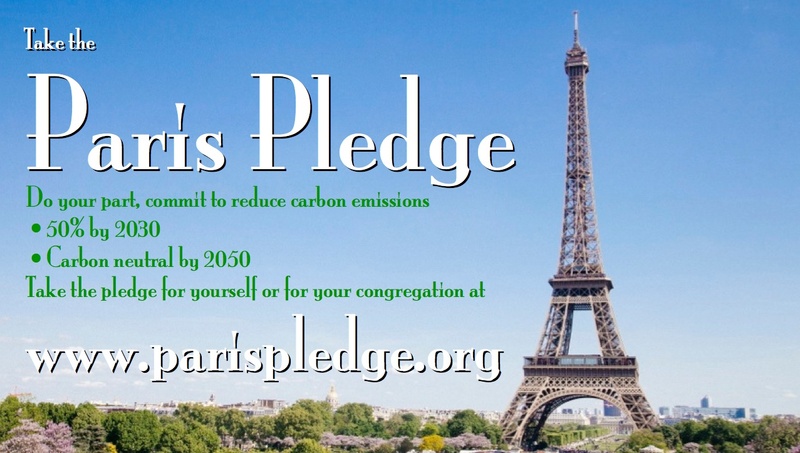 If one institution can do all that, reducing GHG while having fun and saving money, imagine what can be done if we each sign our own Paris Pledge. Before you know it, we’ll reach and blow past the non-binding Paris targets and find that surpassing them and getting to where we really need to go is easier, cheaper and less painful than we’d ever expected. Just like Laurentian’s example, let’s stop arguing if it can or should be done and get on with doing it! Published as my Root Issues column in the Barrie Examiner as "Climate change action needed now"
It’s nice when I can write a good-news story about local government, so I won’t pass up on this story. While some people chafe at rules and think government just wants to control and dominate us, I tend to look at the rationale behind rules and find that even if the rule doesn’t come out right, the motivation behind it is usually for our own good. And that’s the case behind sledding bans. On the one hand, they are meant to prevent injury, for the good of the citizens who might otherwise get injured. On the other, they are meant to protect taxpayers from having to fund huge liability awards, as was the case in Hamilton when the City had to pay $900,000, out of public funds, to cover a tobogganing injury in a city park. A figure like that makes not only that city, but others in the province, sit up and take notice. Some go as far as to enact bylaws banning tobogganing on public land. 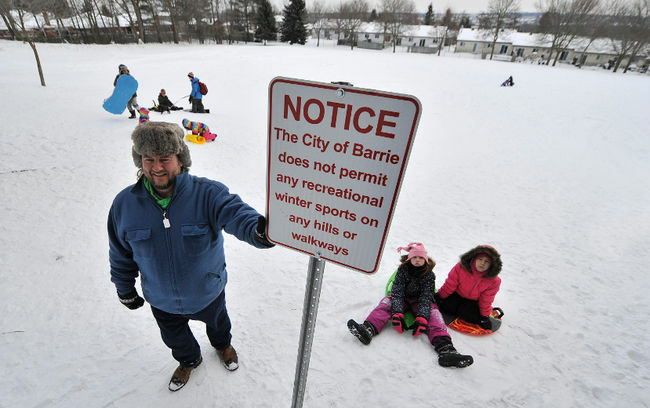 So it was that the City of Barrie, wanting to avoid similar claims, put up signs at various times and locations to warn against sledding. Their concern makes perfect sense. The only problem was the wording used, which took the form “The City DOES NOT PERMIT…” Now, in literal terms, this is correct, in that the city does not issue sledding permits: you don’t get a toboggan license like you would get a dog license or a fishing license, and the City doesn’t create specific sledding hills or check and maintain any hills for safe sledding. So they don’t “permit” it. However, in layman’s terms, “does not permit” means “forbids” or “prohibits”. Which means that schools and other responsible authorities are likely to treat this as a ban, and obviously can’t allow, much less encourage, their charges to break such a rule. Yet what the City really wanted to convey was that if you sled, you are doing so at your own risk, and if you hurt yourself doing it, don’t blame (or sue) the City. And that’s perfectly fair; we should be able to make informed decisions about risk and assume our own risk and take the consequences. 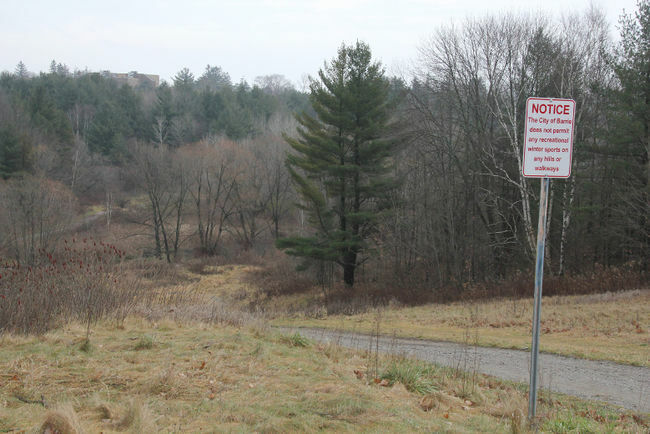 So the wording was causing some confusion, and this is where the good news comes in: when the issue came to their attention, Barrie’s City Council sprang into action and fixed it, immediately! Councillor Arif Khan presented a motion to change the wording, with Mayor Jeff Lehman’s support, and the rest of Council voted unanimously in favour. Within weeks, the wording on all these signs will be updated from “the City does not permit” to “the City does not maintain … use at own risk”. And that’s good for several reasons. It frees schools from having to keep kids off public sledding hills at recess. But perhaps better, since kids are going to sled on good hills after hours regardless of signage, it avoids teaching them to ignore rules and bans. Now, instead of sledding under a “no sledding” sign, they will instead be reading a sign that says it’s okay to sled if they feel the risk is acceptable. They will be learning the principle of assessing risk for themselves. And that’s perhaps one of the most important lessons of childhood activities. Published as my root Issues column in the Barrie Examiner as "City's sign switch offers valuable lesson". See also coverage of this issue by Cheryl Browne here. All of this is a follow-up to a previous column. I don’t buy the idea that government, in general, is a bad thing, designed to harm or control us. I know many in public service or elected office, and most do it for good reasons: to ensure everyone receives the best possible opportunities, services, and benefits of society. Of course, they are all human, so some are selfish or even criminal, while others are incompetent or at best mediocre. But this goes for most organizations, businesses and community groups; it’s not unique to government. Yet government does have special unique powers, one being that unlike business or the non-profit sector, we don’t really have a choice in who governs us. You can pick a different phone company or grocery store but you can’t choose a different government unless you uproot and relocate to another jurisdiction. And though some people do, most find it easier to either try and influence the local situation, or rail against it ineffectively. Now it’s my turn to rant. Not against our federal government, recently released from the pernicious influence of a mean-spirited, near-sighted, narrow-minded government and now blossoming under a new attitude of “sunny ways”. And not against our provincial government, which is far from perfect, but whose current sins are too nebulous and vague to pin with specific complaints. No, this is a rare instance where I must rail against our local government. Of course the largest complaint is against the public school board, whose determination to close Barrie’s last downtown high school and build a new on in the suburbs that refuses to comply with the city’s carefully drawn sustainable development plans, is irksome and chronic and defies logic. But that is already well-covered in our local media, and I’m not sure I have any insight to add right now. Instead, I must complain about our city government, which recently planted a sternly-worded sign atop the toboggan hill my children enjoy during and after school hours, sloping from their schoolyard into a city park. Although this new sign declaring the city “does not permit” sledding or other winter activities was damaged by vandals within hours and disappeared by the next day, I worry it may re-appear. I get that local government has a responsibility to try and ensure the safety of the public, and is liability-averse, but this is the safest sledding hill I’ve ever seen. It is little more than a single story high and free of obstructions. Hills that feed onto a sidewalk or street are understandably perilous; a high school friend lost a younger brother to a sled-car accident on that kind of hill, but this one bottoms out on a large soccer field. The only risk is of kids falling over on an icy day, or colliding with each other, and those are no worse than the risk of slipping on the sidewalk, driveway, or stairs. I take some solace in the fact that the sign didn’t say “prohibited” or list a by-law or fine, and I can find no such by-law on the books. Presumably this is just the city’s way of saying “hey, we don’t encourage sledding, if you get hurt it’s your fault, don’t sue us”. Which is fine, but if that sign is ever replaced, I hope they improve the wording, because “does not permit” is enough to spook the school into disallowing recess sledding. And in this age of overweight, under-active children, banning their sole source of healthy winter recreation is very much a step in the wrong direction. Free the sledders! Published as my Root Issues column in the Barrie Examiner as "Barrie bylaw prohibits tobogganing on neighbourhood hill"; see coverage of this story by reporter Cheryl Brown here, and then read the satisfactory conclusion here. References to Prime Minister Justin Trudeau’s legal marijuana pledge aside, there is another “pipe dream” afflicting many Canadians: the idea of Canada as a burgeoning energy superpower, needing only a few big, shiny new pipelines to link our oil sands to tidewater. This dream is truly a fantasy, not just for environmental and political reasons but simple economics. Of course, the environmental case is clear and, in a rational world, would remain king. Profits and economic growth mean nothing if they come at the cost of poisoning our world, natural assets, and human population. This understanding fuels widespread opposition to expanding extraction of oil or gas, either through dwindling conventional sources or newer hydraulic fracking and other expensive unconventional means. Not only does burning fossil fuels threaten runaway climate change, unconventional extraction multiplies the pollution emitted before the product reaches the ultimate consumer. Unconventional extraction also brings new catastrophic risks to add to the traditional ones of leaks, spills and fires. Accidents like the Deepwater Horizon, spewing oil from a well 4 km beneath the ocean’s surface, can poison seas, kill fish, and wreck regional tourism for years or decades. Fracking can poison water supplies with leaks of unknown toxins, but even when functioning smoothly, causes earthquakes in relatively stable areas like Alberta and north-eastern BC. 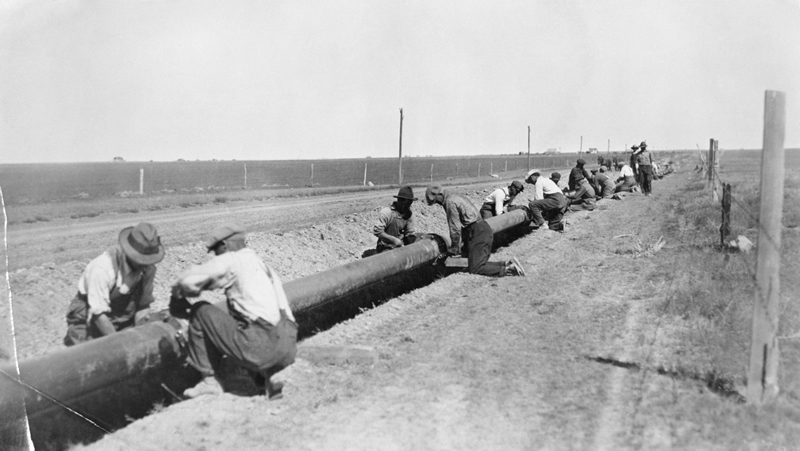 Back when pipelines at least created jobs. But even if one foolishly ignores immediate and local environmental risks, or long-term global harms of injecting more fossil carbon into the atmosphere, solid social and economic reasons say pipelines will never be built. Of course, fossil supporters (like the astroturf Facebook group “Canada’s Energy Citizens”, who seem to have sworn allegiance to the oil patch) loudly bemoaned US President Obama kyboshing the Keystone XL proposal, and will soon be whinging about BC’s declaration that the Kinder Morgan twinning proposal fails to meet any of the 5 conditions the province set for it. They heap critical scorn on First Nations, environmentalists, or other stakeholders who use hearings and courts to demonstrate that fossil extraction infrastructure does not have social license. Yet the real economic truth is these pipelines still could not be built, even if every objection were removed. New pipelines cost billions and take years to construct, and Canada’s oil companies can’t pay for it themselves, as their revenues have already been promised to (largely foreign) owners and shareholders. Instead, they borrow from banks, promising to repay the loan and interest out of the profit from shipping the oil. Yet with our dollar sinking and oil at $30, the lowest since 2003 and still dropping, supply still exceeding demand with the world’s largest consumers either exporting their own oil (US) or facing prolonged economic doldrums (China), there is no money to be made from pumping out expensive bitumen for years or decades to come. Even if demand picks up, global purchasers will choose cheap conventional crude over expensive heavy bitumen, leaving our products literally at the bottom of the barrel. So any new pipelines actually built will be a recipe for bankruptcy not only for oil companies that build them, but for banks foolish enough to finance them. And since Canadian banks have a well-deserved reputation for prudent lending, the real obstacle to pipelines isn’t environmental cost, political climate, or public resistance; it’s harsh economics. Published as my Root Issues column in the Barrie Examiner as "Economics the real obstacle for new pipelines"